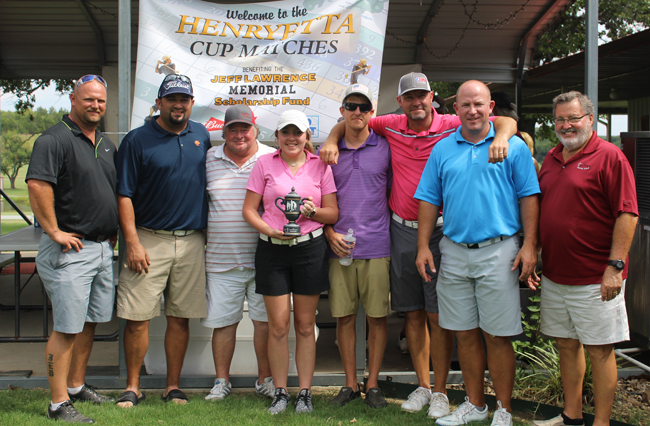 The winner of the 2017 Henryetta Cup was determined Sunday afternoon by a scanty 4.5 points following 54 holes of golf in two days. With a score of 191 points, the Henryetta team of J.W. VanDenborn, Jason Cunningham, Bruer Torrix, Casey Jones, Ray Tarwater, Jed Hill, Billy McDonald and Morgan Brown fended off two attacks on Saturday and Sunday. The two day tournament at the Henryetta golf and county club sees participants split into four teams: Henryetta, Seminole, Trosper and Cushing. They are named for the three state championship contests the late HHS golfer Jeff Lawrence won during his short career. Play is broken down into 27 holes of golf in a Ryder Cup format on Saturday and Sunday. At the end of the first round, the Henryetta team had a nine pont lead over the Seminole team composed of Justin Been, Wayne Robertson, Butch Glover, Shawn Pye, Dutch VanDenborn, Billy Brown, Beryl Davis and Stephenie Taylor. Cushing’s team of Brandon Andrews, Mark Deason, Tim Hicks, Dusty Mulliniks, Murry Key, Dickie Hefner, Greg Ogle and Emily Machetta picked up enough points to take second and get within nine of taking the lead. Both Henryetta and Seminole grabbed 23.5 points in the second round of play Sunday setting them in first and second place. The final round saw the Henryetta team falter as Seminole, Cushing and Trosper all picked up more points. The Seminole team had the best round in the final round with 42.5 followed by Cushing with 40.5 and Trosper tallying 39.5. Henryetta’s team struggled to gain 37.5 points but had already banked enough points to come ahead for the win. The Trosper team was composed of Billy Torrix, Jason Thomas, Shane Stogner, Drew Cunningham, David Warden, Dale Horn, Gary Carnes and Gayle Machetta. The tournament is held as a fundraising effort by the golf course for scholarships awarded to Henryetta seniors.